After months of rumour, it's been confirmed that Bruce Springsteen will be one of the headliners at this year's Glastonbury Festival. Glasto honcho Michael Eavis said, "I'm so pleased that Bruce Springsteen has agreed to come to Worthy Farm for the first time. He's one of the all-time rock legends and I'm confident that this will be one of our best shows ever." He then went on to make an statement that'll no doubt get into Private Eye's next Obamaballs column: "He's also a Barack Obama supporter, which makes two headliners in a row who've backed the new President." What, were Muse for Nixon? 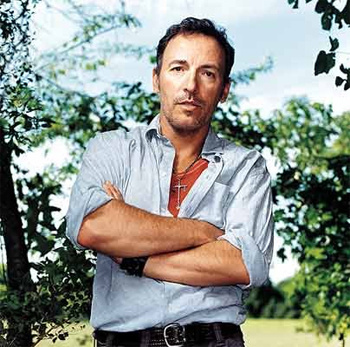 His daughter Emily Eavis added, "I'm knocked out that we've managed to get Bruce to play. It's the icing on the cake of this year's bill, which I'm sure will take everyone's breath away when we announce the full details."